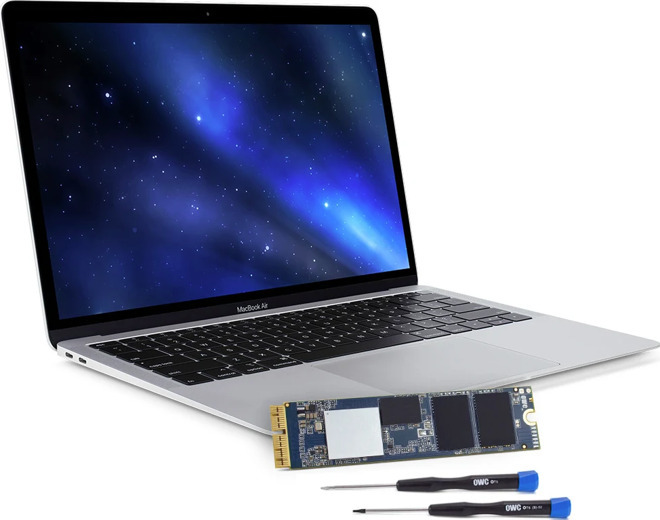 OWC on Tuesday launched several Aura Pro X2 SSD drives and upgrade kits, meant to enhance speed and capacity on a select range of older Macs. The drives have maximum read performance topping 3.2 gigabytes per second, and can write at 2.4 gigabytes, OWC said. Some kits come with an external USB 3 enclosure for repurposing an original SSD and/or transferring old data. Compatible Macs include 2013-2017 models of the MacBook Air, 2013-2015 MacBook Pros, the 2013 Mac Pro, and the 2014 Mac mini. Though some configurations may already have SSDs, OWC is promising better power consumption, cooler temperatures, and potentially extra storage, depending on the drive. Each one also comes with a 5-year limited warranty. The cheapest X2 drive is a 240-gigabyte unit for $119.99. Prices rise to $179.99 for 480 gigabytes, $299.99 for 1 terabyte, and $699.99 for 2 terabytes. OWC claims that similar upgrades through Apple can cost several hundred dollars more apiece. OWC's full upgrade kits vary in price depending on the target Mac. Beyond external enclosures, they can ship with a heat sink and/or any necessary tools.